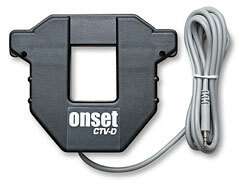 A split-core AC current sensor responsive over the range of 20 to 200 amps AC for use with U12, UX120 and ZW data loggers with external input channels. With an input current of AC current, sine wave, single phase 50 Hz or 60 Hz, load power factor 0.5 to 1.0 lead or lag. The molded-plastic housing is rated for indoor use per UL508. Construction and operating environment: Molded plastic housing for indoor use per UL508; pivoting leg (leg on CTV-D and CTV-E units is fully removable); UL listed.